Haines City is now on the map as an amazing spot to hold a wedding ceremony! The community has a wonderful venue. It is the Lake Eva Event Center and it is amazing! Nestled on a gorgeous lake, this venue located just off Route 27, features both indoor and outdoor sites. There is also a large multipurpose room that can hold hundreds of guests comfortably. I love that room, since it can become anything that a bride and groom want it to be, with help from any of the fantastic lighting companies that we have in Orlando! I conducted a wedding in this magnificent facility just recently, and have the following experience to relate: I was greeted by the event coordinator who was friendly and accommodating. This kind gentleman showed me the space that would be used for the ceremony and it as just perfect. I immediately felt at home and excited about the upcoming wedding ceremony. The day was on the warm side, so I was happy that we held the ceremony in the main rotunda. It was not a large group in attendance, but a very happy one! 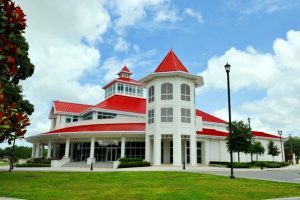 I have conducted weddings in most of the popular venues in Orlando and the surrounding area, but I can honestly say that the sound in the rotunda at the Lake Eva Events Center is the best that I have heard. I was so impressed by what I heard. The sound was rich and warm. Perfect for an amazing ceremony for any couple on their most important day! My name is Lon Tosi, and I am the Vice President of the Largest officiating company in the United States, Sensational Ceremonies. So I can speak with conviction that I totally endorse The Lake Eva Events Center in Haines City. It is beautiful, and of high quality, and it can become the vision of whatever you have dreamed for your wedding ceremony. Check it out! I did, and I love it! Did I mention that it is not far at all from the wonderful attractions that we have in Orlando, like Walt Disney World, Universal Studios and SeaWorld Orlando? What I especially liked is that it is so close to my home in Celebration, Florida. Perfect! By the way, Married By Mail secured the license for the couple that I married in this great event center. Married By Mail is the largest licensing service in Florida, and very successful with all 5-star reviews on the Knot. Check them out as well!